Announcement Grab a brush pen + get started! 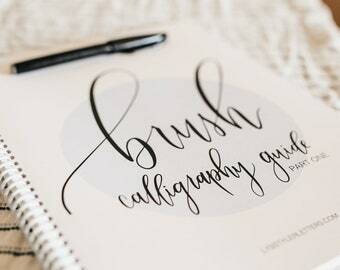 Grab a brush pen + get started! My daughter was so excited to receive this for Christmas and it is so well done. Thank you. Gold place cards add a beautiful finishing touch to your wedding or event! Lyss Tyler Letters was started on Instagram back in 2015. It all started as a way to reduce stress and relax. I would post my practice pieces on Instagram as a way to keep track of the things I had made. Slowly, my following began to grow and I was encouraged to open up an Etsy shop. The last few years have been filled with a lot of trial and error figuring out how to use this creative platform. I started teaching others brush calligraphy at the beginning of 2016. It has been so much fun to be a part of teaching others this wonderful art form! I am a big fan of community over competition and spreading positivity, which I believe you will start to see as you follow along. I believe there is enough room for all of our creative talents and artistic expressions. You have something uniquely beautiful to offer the world - don't be afraid to put yourself out there!